Finds the nearest Candidate feature(s) to each Base feature and merges their attributes onto the Base feature. May also be used in Candidates Only mode, where each feature is considered the Base in turn and compared to all other features, but not itself. The NeighborFinder generally takes in two sets of features - Base and Candidate. For each Base feature, the transformer checks the Candidates for matches, based on proximity and parameter selections. It may check for the closest Candidate feature, or a fixed maximum number of closest Candidates, or all Candidates that fall within a specified distance of the Base feature. Attributes from multiple matching Candidates may be stored in a List attribute. Output includes Matched Base features with these new attributes, Unmatched Base features (unchanged), and Unmatched Candidates (unchanged). The NeighborFinder works with 2D geometries only; if an input geometry is 3D, its z-coordinate will be ignored. The transformer has full support for points, lines, arcs, ellipses, polygons, and donuts, and has limited support for other types of geometry. Polygons, ellipses and donuts may be processed as lines or areas, depending on user selection. 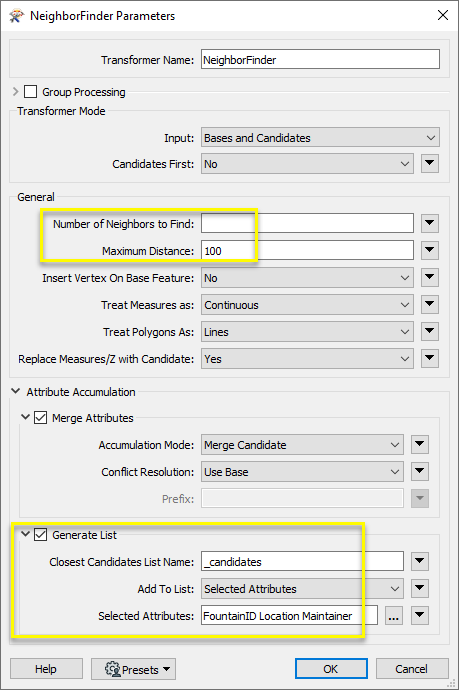 The NeighborFinder can be used in a Candidates Only mode, in which only Candidate input features are considered. In this mode, each feature is considered the Base in turn, and compared to all other Candidates (but not itself). Attribute sharing and Output behavior are the same as above. Candidates-Only Mode is enabled with the Input parameter. When Input is set to Candidates Only, the Base input port is removed. In this example, we have a set of parcel polygons with no useful attributes, and a point dataset intended for labeling, with address attributes. We want to extract the addresses and apply them to the parcel polygons. Though a PointOnAreaOverlayer would perform a similar comparison, it wouldn’t find a match where the point falls just outside the polygon, as in #1132. We will use a NeighborFinder. The parcel polygons are routed into a NeighborFinder as the Base features - the ones that the transformer will try to find matches for. The address points are connected as the Candidates - the ones that will be searched for a match, and will then supply the new attributes to the Base features. In the Parameters dialog, Number of Neighbors to Find is set to 1, as we want only the single closest match to be used. Treat Polygons As is set to Areas. 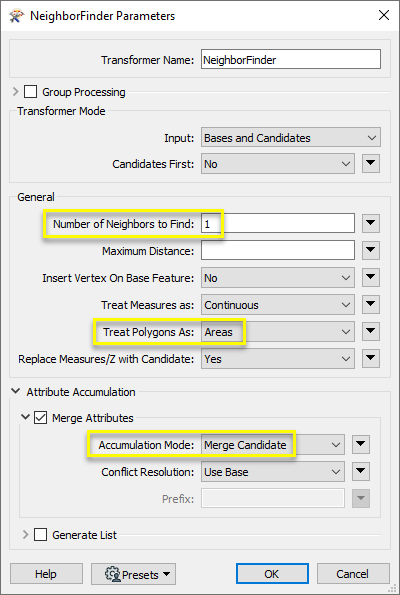 Note that the default setting for Accumulation Mode - Merge Candidate - will copy the Candidate’s attributes onto the Base feature (which is what we want). 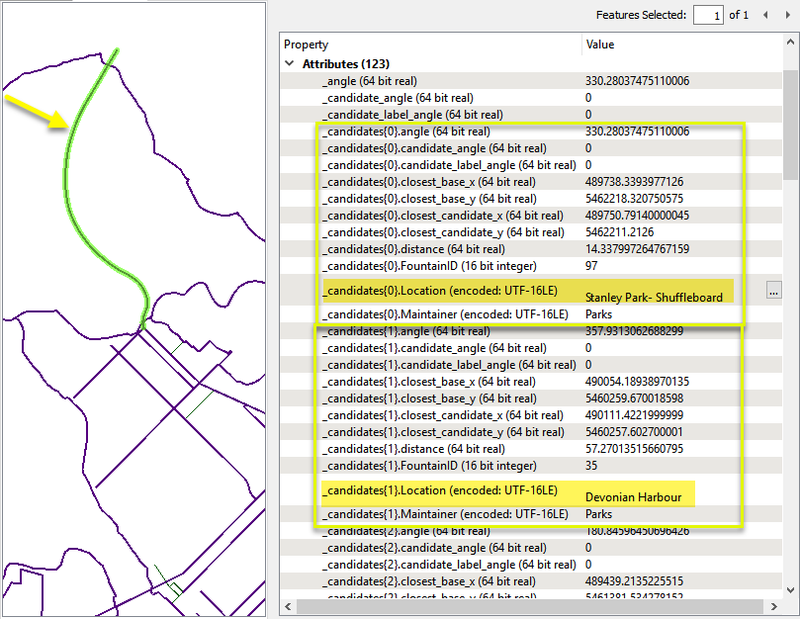 The output Matched parcel polygons now have attributes from their closest Candidate match. 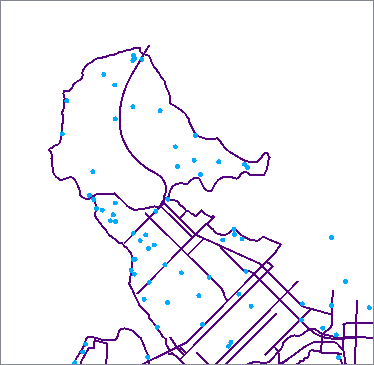 In this example, we have a dataset of bike path lines, and want to find drinking water fountains within 100 meters of the paths. The bike paths are routed into a NeighborFinder as the Base features - the ones that the transformer will try to find matches for, and output. The water fountain points are connected as the Candidates - the ones that will be searched for matches, and will then supply attributes to the Base features, as a list. By enabling Generate List and selecting specific attributes from the drinking fountain data, a list attribute will be added to the bike paths to store multiple matches. One item is added to the _candidates list attribute for each match, as shown on the selected feature here. The list can be further manipulated to work with this information - see List Attributes. Many transformers can assess spatial relationships and perform spatial joins - analyzing topology, merging attributes, and sometimes modifying geometry. Generally, choosing the one that is most specific to the task you need to accomplish will provide the optimal performance results. If there is more than one way to do it (which is frequently the case), time spent on performance testing alternate methods may be worthwhile. To correctly analyze spatial relationships, all features should be in the same coordinate system. The Reprojector may be useful for reprojecting features within the workspace. Testing for the existence of spatial relationships between two sets of features, and routing them according to whether they pass or fail the test(s). Identifying the nature of spatial relationships between two sets of features. Finding polygon overlaps and extracting them into new geometry. Finding intersections between lines and polygons, and splitting the lines where they intersect with the polygons. Finding intersections between line features, splitting them, and generating new line geometry as well as points representing the intersections. Identifying where points fall on lines, and splitting the lines into new geometry. Identifying points in the same location (within a tolerance), and merging attributes between them. Finding intersections between all input features, regardless of geometry (optionally including self-intersections), splitting features, and creating new geometry. Comparing features against a set of Clipper features, and splitting the features at or along the Clipper boundaries. Outputs both new and untouched geometry, identified as either Inside or Outside the Clipper. Identifying the nearest other feature(s) to each feature being considered, either in another set of features or within the same feature set. Analyzing spatial relationships between features to compute topology, splitting features and creating new geometry representing topologically significant nodes, edges, and faces, with associated attributes. * NOTE: Curve includes Lines, Arcs, and Paths. Area includes Polygons, Donuts, and Ellipses. Spatial analysis can be processing-intensive, particularly when a large number of features are involved. If you would like to tune the performance of your workspace, this is a good place to start. When there are multiple ways to configure a workspace to reach the same goal, it is often best to choose the transformer most specifically suited to your task. As an example, when comparing address points to building polygons, there are a few ways to approach it. The first example, using a SpatialFilter to test whether or not points fall inside polygons, produces the correct result. But the SpatialFilter is a fairly complex transformer, able to test for multiple conditions and accept a wide range of geometry types. It isn’t optimized for the specific spatial relationship we are analyzing here. The second example uses a PointOnAreaOverlayer, followed by a Tester. The features output are the same as in the first method, but the transformer is optimized for this specific task. The difference in processing time is substantial - from 54.3 seconds in the first configuration, down to 13.7 seconds in the second one. If performance is an issue in your workspace, look for alternative methods, guided by geometry. If a feature is routed to both the Base and the Candidate input ports, then features will be compared to themselves as they are both a Base and Candidate. If Input is set to Candidates Only, there will be no Base port. All Candidates will be compared with all other Candidates, but will not be compared to themselves. Features to receive attributes from matching Candidates, according to the parameters defined in the transformer, and to be kept as output. Features that will provide attributes if they match the conditions defined. Candidates are not output. In Candidates-Only mode (Input parameter set to Candidates Only), Candidates will behave as both Candidate and Base, and so will also receive attributes from matches and be output. If a Candidate feature is found, then all the attributes from the closest Candidate feature are added to the Base feature and the Base feature is output via the Matched port. If Generate List is enabled, either all or selected attributes from multiple matching Candidates may be added to a new list attribute. _angle The angle between the closest interpolated Base point and the closest interpolated Candidate point. _closest_base_x, _closest_base_y The coordinates of the closest interpolated point on the Base feature relative to the Candidate feature. _closest_candidate_x, _closest_candidate_y The coordinates of the closest interpolated point on the Candidate feature relative to the Base feature. _candidate_angle The angle from (_closest_candidate_x, _closest_candidate_y) to the next vertex within the Candidate feature. If (_closest_candidate_x, _closest_candidate_y) equals the last vertex of the Candidate feature, then candidate_angle will be the angle from the previous vertex of the Candidate feature to (_closest_candidate_x, _closest_candidate_y). _candidate_label_angle The _candidate_angle adjusted so that if it is used as a text rotation, the text will run from left to right. This angle is guaranteed to be greater than or equal to 270 and less than 360, or greater than or equal to 0 and less than or equal to 90. All angles are measured in degrees counterclockwise from horizontal. Where angles are not well-defined (for example, when a Candidate polygon is contained inside a Base polygon), they are set to 0. If there are no Candidate features found to be within the maximum distance, then the Base feature will be output unchanged via the UnmatchedBase port. Candidate features not within the Maximum Distance to any Base feature are output via the UnmatchedCandidate port. Candidate features in excess of the Number of Neighbors to Find parameter will also be output here (only the first x number of matches will be used). If Generate List is not enabled, then any features within the Maximum Distance, but not closest, will be output from the UnmatchedCandidate port. This is because they are not used in any way; their attributes are not merged onto the base at all. Invalid features are output via the <Rejected> port. Base and candidate features with null geometry will be rejected. Features with invalid geometries may also be rejected. Group By The default behavior is to use the entire set of features as the group. This option allows you to select attributes that define which groups to form. Bases and Candidates - Accepts both Base and Candidate features (default). If a feature is routed to both the Base and the Candidate input ports, then features will be compared to themselves as they are both a Base and Candidate. Candidates Only - Accept only Candidate features. There will be no Base input port. All Candidates will be compared with all other Candidates, but will not be compared to themselves. The maximum number of Candidate features that will be included in the list specified by the Generate List parameter. The closest candidate features will be included in the list. If the value is 0 or blank, there is no limit to the number of neighbors that will be included in the list. The Maximum Distance is measured in the units of coordinates of the input features. The list specified in Generate List contains all of the Candidate features that were within the Maximum Distance of the Base. Candidates exactly at the maximum distance will be included in the Closest Candidate List. If the value is 0 or blank, no limit will be put on the maximum distance. If Yes, then (_closest_base_x, _closest_base_y) will be inserted onto the Base feature if the insertion is well-defined. For example, if a Candidate polygon is contained inside a Base polygon, insertion will not take place. If Yes, the _closest_base_x, _closest_base_y vertex will be inserted onto to the Base feature as well as added as an attribute. This option only applies to Lines, Polygons, Paths, Arcs, Ellipses, and Donuts. Measures added to the base can be treated as Discrete, meaning that they will be taken from the nearest known measure value, or Continuous, meaning that they will be interpolated from the nearest points. If Yes, then all Candidate features must be input before any Base features. If a Candidate feature is input after a Base feature and this option is set to Yes, the Candidate feature will be ignored in all calculations. Lines: A polygon, donut, or ellipse will be treated as a line (that is, its boundary line) for backwards compatibility. Areas: A polygon, donut, or ellipse will be treated as an area, and any geometry that overlaps with the area will be of 0 distance away from that area. If the candidate is a line, and the base is a point, this will specify if measures and z values should be copied from the candidate to the base. The z values will be equal to the interpolated z values at the point on the candidate that is closest to the base. The measures will either be interpolated or use the nearest known measure value, depending on the Treat Measures as parameter. If the candidate is not a line, or the base is not a point, this will have no effect. 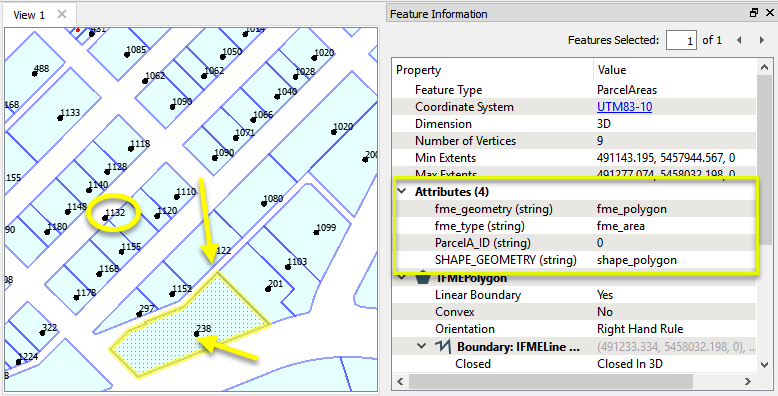 If attributes on the Base and Candidate feature share the same name, but are not geometry attributes that start with fme_, then they are deemed conflicted. Accumulation Mode Merge Candidate: The base feature will retain all of its own un-conflicted attributes, and will additionally acquire any un-conflicted attributes that the candidate feature has. This mode will handle conflicted attributes based on the Conflict Resolution parameter. Prefix Candidate: The base feature will retain all of its own attributes. In addition, the base will acquire attributes reflecting the candidate feature’s attributes, with the name prefixed with the Prefix parameter. Only Use Candidate: The base feature will have all of its attributes removed, except geometry attributes that start with fme_. Then, all of the attributes from one (arbitrary) candidate feature will be placed onto the base. Conflict Resolution Use Base: If a conflict occurs, the base values will be maintained. Use Candidate: If a conflict occurs, the values of the candidate will be transferred onto the base. Prefix To prevent a Candidate attribute from being ignored because the Base attribute already exists, you can optionally specify a prefix that will be applied to each Candidate attribute when it is added to the Base. This parameter is only enabled when the Accumulation Mode is Prefix Candidate. When enabled, adds a list attribute to the Matched output features. This parameter is useful when the Number of Neighbors to Find is greater than 1. Enter a name for the list attribute. All Attributes: All attributes will be added to the output features. Selected Attributes: Enables the Selected Attributes parameter, where specific attributes may be chosen for inclusion. Selected Attributes Enabled when Add To List is set to Selected Attributes. Specify the attributes you wish to be included. Search for all results about the NeighborFinder on the FME Community.